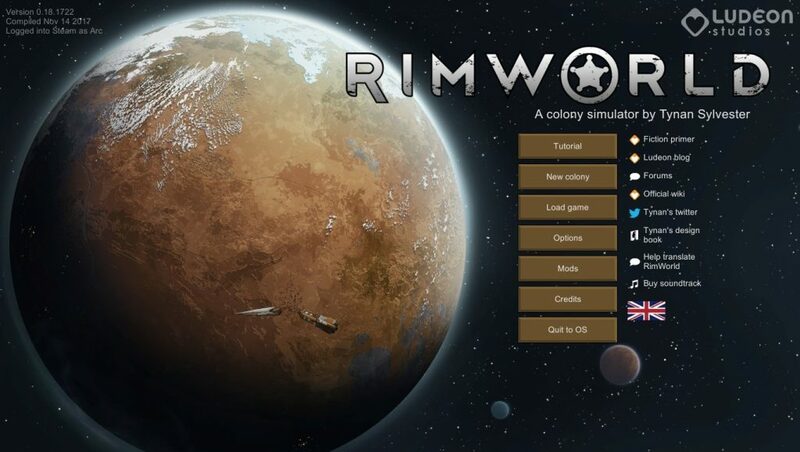 RimWorld takes place in the near future, after the discovery of other inhabitable planets for humans that have yet to be discovered, and before colonization efforts have started, sending Humans and other animals there in large droves. That being said, the start of your story can be altered depending on your choice of action. You begin by selecting a group of colonists, from an entrepreneur looking for thrills to a small nomadic tribe searching for a new home. Along with your starting Colonists, you need to decide on a narrator for the story of your colonists as well as a difficulty setting. It’s the narrator who determines what kinds of challenges you will face. 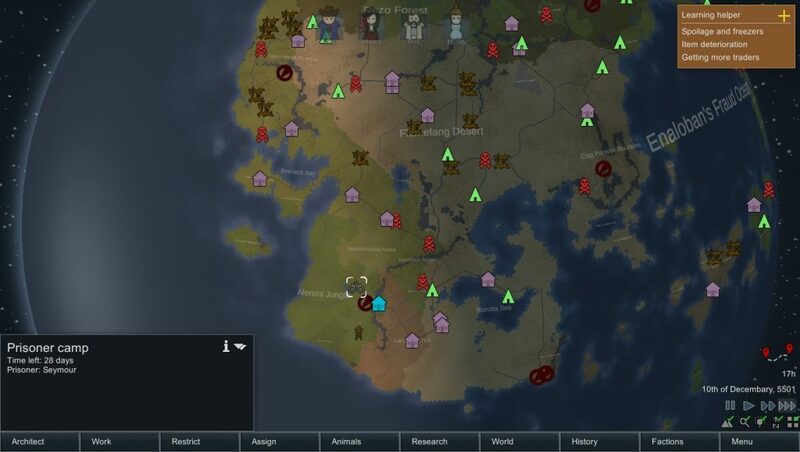 Over time, the challenges will range from trading caravans to raiding opposing tribes, to mentally affecting satellites, and even warding off droves of alpha beavers threatening to devour all the wood in sight. The end goal of the game is to eventually escape from the planet with a new spaceship, by either finding the crash site of one or building your own once you’ve acquired enough resources. 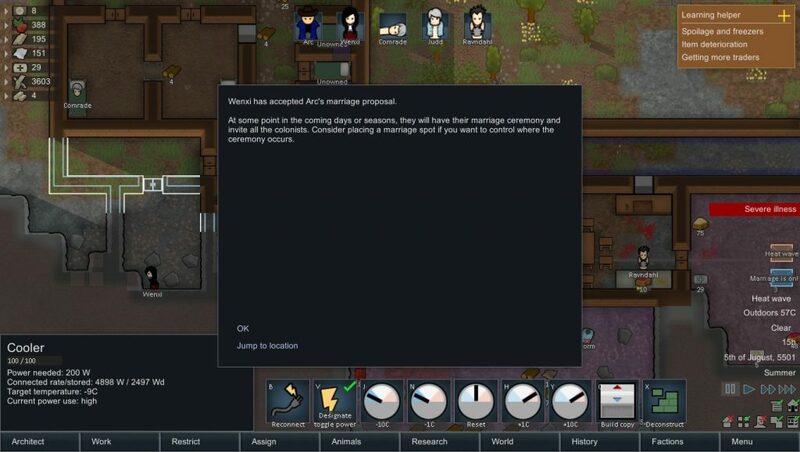 Overall, I would say that’s not the point of the game; the real goal is to establish a home for yourself and your colonists. After all, there are many ways to attempt this (and succeed), but as long as you are surviving, you are doing well by the game’s standards. After picking a landing zone, preferably one close to a source of materials like wood, metal, or stone, you then have to decide what kinds of colonists might stand a chance against the harsh elements. 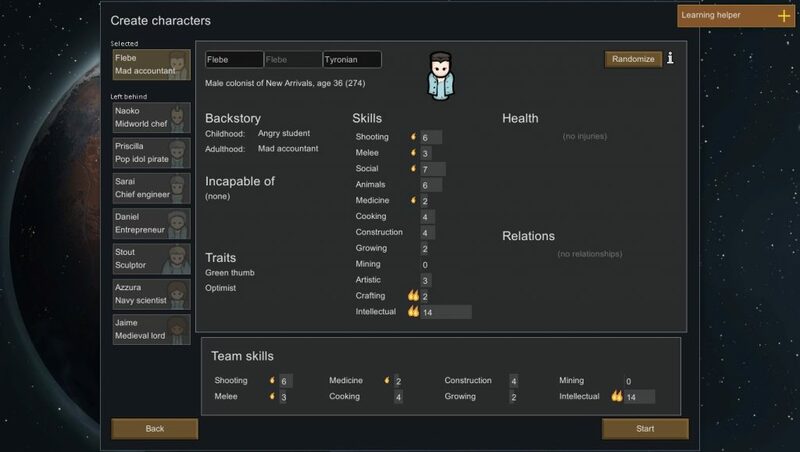 Here are some things to watch out for, indicated by a character’s skill points and their traits, but the team skills have a bigger impact on the outcome of your colony. But for now, just pay attention to the incapable tab because that tells you what a colonist will refuse to do. And if they refuse to act in a certain way, like resorting to violence, then you might be in danger when raiders attack since they can’t defend the home base. When getting starting, I’d advise you to look for colonists with ample potential, represented by the flame icon next to their skills. It shows that they grow quickly in these areas, making them good for a colony long-term wise. Either way, don’t worry too much about it because until you get a feel for the game, this screen will look intimidating. The game does a decent job of guiding you with on-screen prompts that appear in the lower left. 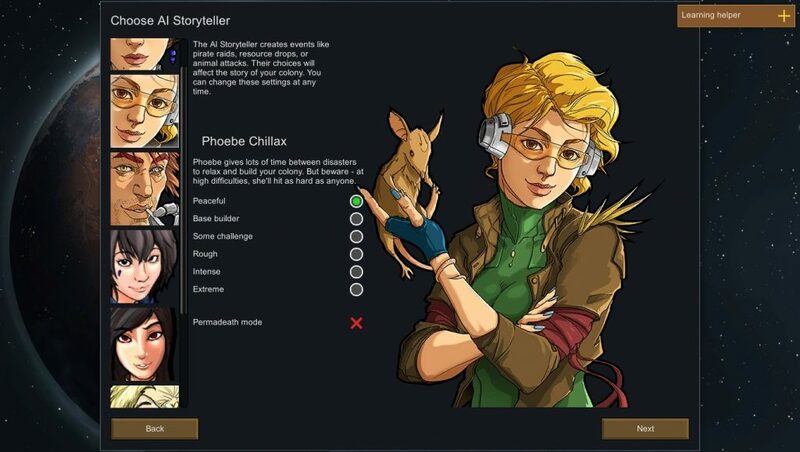 But truth to be told, the game finally opens up once you begin exploring your options for how you can assign colonists to specific tasks like crafting and trading. 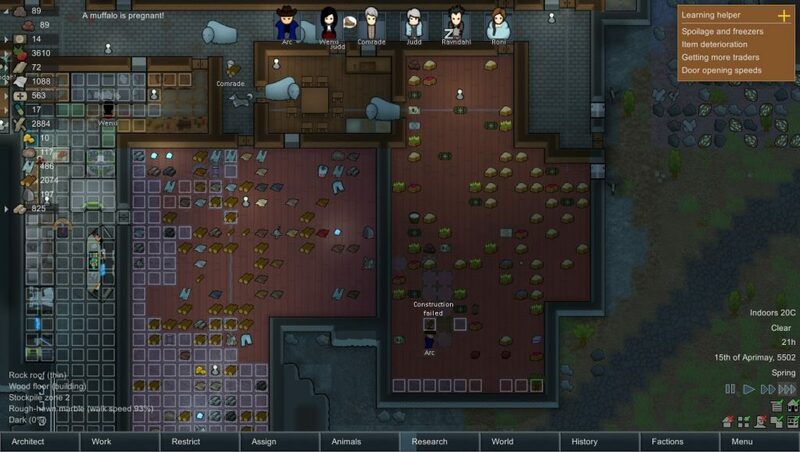 On a single playthrough, you might think it’s smart to set up a fort on all sides, but learn that this limits the amount of room you have to expand your colony. On a second attempt, you could stack it into a mountain or a pyramid for protection. But mining can be taxing, and food doesn’t grow at higher altitudes. You might as well try to be nomadic, fleeing when the going gets tough, but soon realize that not having a solid place to call home prevents you from prospering. Each environment has its ups and downs, affected by the weather or whoever (pirates, hostile tribes, wild animals) lives nearby. The actual meat of the game is simply the day to day operations of your home base. This involves assigning your colonists to perform certain duties, acquiring enough food to scrape by from hunting or farming, constructing walls and roofs to stay safe, building stronger defenses, and recruiting new colonists to improve your home base. Long-term wise, the game can get repetitive. Watching the colonists is kind of a chore once you’ve taken care of the essentials. The best thing to do at this point is to change up your daily routine, perhaps get more food so you can focus more on reaching a specific goal, or cut down on your maintenance to allocate resources. If you stick to it and keep your people busy (and in good health), then your base will grow and thrive to a point where you can escape the planet…forever! Even if I still haven’t been able to yet, as sad as that may be. This game is so grandiose, given the number of mods that alter the gameplay and create more options, thereby causing me to lose motivation in getting to the end. I was just having too much fun building a good colony or using the mods to explore new options such as placing myself and Wenxi into the game as cyborg colonists. There’s some other stuff I didn’t bother with as much like fighting ancient machines, mass farming livestock, digging out of snow, and keeping enemies imprisoned. I will say that I had a lot of fun with this game and it is one of the few titles I’d revisit to check on the creator’s updates. I will admit that the RNG system is all over the place for better or worse, and I was forced to scrap an entire colony because I got screwed out of a solid area to build upon. 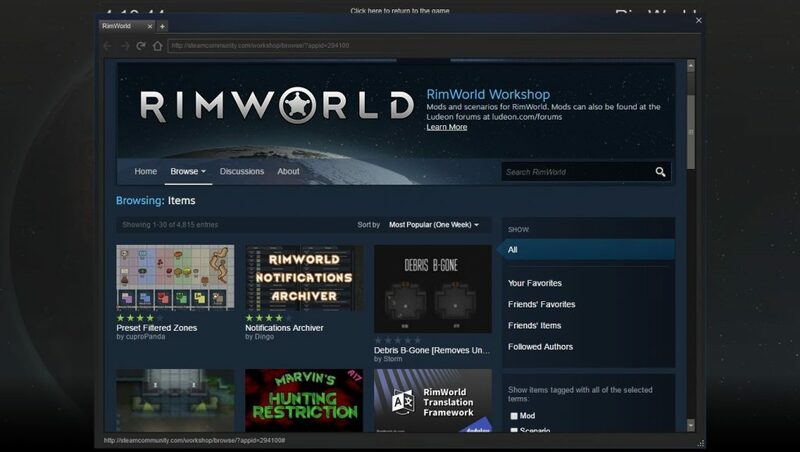 According to the Steam page, the colonists are not pioneers in any manner. They simply crashed on an unknown planet, rife with opportunity and potential disaster. Imagine if you had to secure diplomatic relations while a war was going on. And monitor the well-being of injured parties as they recover from wounds or witness traumatic situations. The small tweaks and alterations you can work on are well worth the time spent replaying the game. I didn’t go too in-depth for this review because if I had to explain everything: The construction, the farming, the animal taming, the decorating, the recruiting of raiders, or the crafting of tools, then you would be here for another hour. 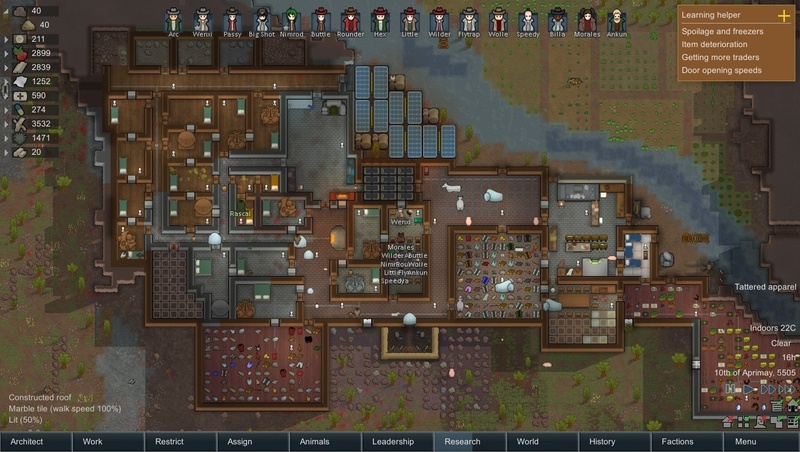 RimWorld has an overhead view of the colony. But it does give off the appearance of an endless flat world. Each tiny square block is pretty much a ground tile, similar to Minecraft, but in 2-D if you plan to do some constructing. It has a drag and drop mechanic, allowing you to lay down all kinds of facilities for the means of production. All things considered, I strongly recommend this game to people who are fans of real-time sim games which is why I gave it a solid rating for providing an engaging narrative and an endless supply of options to choose from because being God is a lot of fun.